WHAT did that place do to us??? Naim has had a rash, Avery and I and Nik have been having headaches and dry coughing and other unmentionables and have been incredibly tired. Aaron and Sully seem to have been spared. I think we may have all gotten mildew poisoning. It has been a very slow and sluggish week. We are going to wash all the laundry and sheets this weekend (needs to be done anyway) and give Sully a bath and open up the house and see if that will help us get the spores out or whatever we’ve all got. I should have gotten hazard pay. Of course I cannot prove causation, but I highly suspect. It isn’t like we caught a virus, it is a different kind of sickness. I hesitate to let the kids go to D’s house, especially with Naim’s rash. I suspect it is not contagious, but do not want to risk immune suppressed D with his skin problems to a skin problem I don’t know about. If he can’t get it cured over the weekend, I will have to take some of us (Naim) to the doctor. The rash is preventing us from swimming, visiting D, and even canceled my dentist thing because they were supposed to go over to D’s. So, Avery went to school today (and again it was like willing my legs to walk over there and I had to take a rest break there. redic!) Here is his freely. Naim did lesson 9 of DER. We went over the workbook and questions. Aaron read “Knight Fight” and did the stuff in the back of the book. We did sentence school, Letter -b- in HWT and copywork in journals. Naim did worksheets for Lesson 15 in HOP, and reread story. Aaron did Lesson 1 worksheets in HOP. (had to do one over again because he fucked it up so bad. I just tossed it and reprinted it and had him do it over. But to be fair, they had words on there that he had never seen before and had to match the beginnings of words with either -ch or -tch. When I had him do it again, I wrote all the words out for him on a separate sheet of paper, so he just had to read and match them. They did a bunch of brain pop jr. this afternoon. They read a book each for the library summer reading project. They finally finished up the bacteria experiement, which I thought was a bust, but I held on to the petri dishes a little longer and they finally sprouted spores. (Spores seem to be a theme for us lately.) I have a picture on the ol’ iPad. 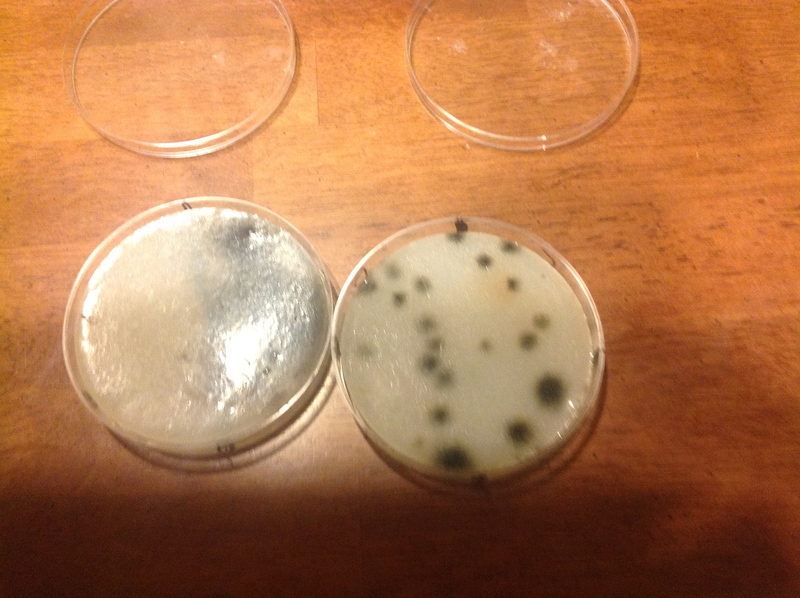 In the dish on the left, the clear side was after Naim washed his hands, and the blackish side is before. So, soap works! The other dish was divided into four quadrants. The top left was a sample from Naim’s tongue, the top right was Naims toes, the lower left is Aaron’s arm, and the lower right is Naim’s hair. Conclusion: We are dirty all over.